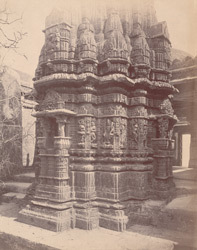 Photograph of the details of the moulding and the sculptures on the façade of a small temple in the Pancha Pandava Tuk at Satrunjaya in Gujarat from the Archaeological Survey of India Collections taken by Henry Cousens in the 1880s-90s. Satrunjaya is an ancient Jain place of pilgrimage. On the two summits of the hill, which rise 600 m above the plain around the town of Palitana, there are many hundreds of multi-spired temples where pilgrims come to pay reverence to the different Jain saints. The sanctuaries are grouped in fortified enclosures or tuks, named after their founders and are not earlier than the 16th century. In the Bombay List of 1897, Henry Cousens wrote, "This temple is without doubt an old Hindu shrine converted to Jaina use. The exterior, which remains in much of its original condition, has been beautifully carved, but has also been much mutilated. The proportions of the images which decorate the walls are much better than those of any other statues on the hill. Among them are the Hindu gods and goddesses Mahakali, Varuna, Vayu, Kubera, Isa, Sarasvati, etc. Two inscriptions in this temple record the setting up of the images of Timamuti (not Bhimamuni) and Yudhishthira in Sam. 1788."